Just throwing some fun stuff out here today. 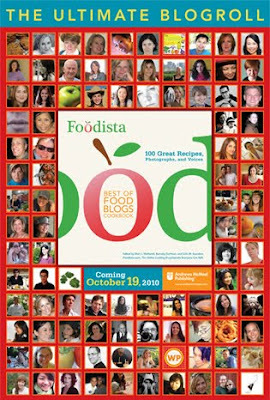 I found out yesterday that one of the recipes I submitted to The Foodista Best of the Food Blogs Cookbook contest was a winner! Winner, winner, chicken dinner! Raise the roof! Fist Pump! High Fives all around! Happy Dance! I'm also ecstatic to see some of my blogger friends have also made the cut...take a look at that picture down there and tell me you don't recognize some of those mugs (see mine...2 down, 2 in...on the right)!! I see LeaAnn, Malou, Katie, Jamie, Nancy, Mathea...who else? Give me a shout if I missed ya. I'm going off the pictures I can decipher...wanna wait to go through all of the recipes when I have the evidence in my hot little hands!!! My soup is in stellar company to say the least! A huge congrats to all of the winners! Over 1,500 recipes were submitted, voted on, and whittled down to 100 winners! Andrews McMeel will publish "the winning blog posts and recipes in a beautiful, full-color, internationally distributed cookbook, set for release on October 19, 2010." ~from Foodista Thanks so much to Foodista for giving us all this wonderful opportunity...and to everybody who voted! You can pre-order your copy by clicking on the link below! When I was contacted by Wikio to see if I'd like to put up a sneak preview of the newest Food Blog Rankings on their site, I thought...why not!? I'd just recently heard of Wikio when somebody pointed out that girlichef was listed there. All I can say is...very cool! I love finding new places for girlichef to gain exposure...and I happen to see a couple of other sites in the upcoming top 40 that I read. I even have some friends and bloggy pals on there go, Deb & Priya ...woot! Wikio is a participative service: you can publish an article directly on the site or comment on an existing item. You can also vote for an article or a group that captures your interest in order to increase its visibility on the site. So, here's a sneak peak at the soon-to-be-released Food Blog rankings on Wikio! If you ever see a little symbol like this... ...that's what it's all about- Wikio! Well done and well-deserved! Congratulations! Congrats girlie girlichef. You are famdamtastick. aaaaaand....that deserves a little celebration. time to break out the margs! Cheers!!! Heartfelt congratulations..you truly deserve this for being such a beautiful blogger!! Wow!!! Huge congratulations! You deserve it all! VERY, very cool! 'Cause you do good work, and your blog is one of my favorites ... of course there's success! Woot Woot!!! Way to go chica!! That is incredibly awesome!!! so happy for you (for both!) im dancing the happy dance with you! yeah, yeah! haha! Thanks for the mention too... so let's dance the happy dance one more time... yeah .. yeah! yahoo! LOL! Congrats!! !May you have many more!! !God Bless!! YAY!!!! I saw your lovey face right away and was so happy! I am so proud to be part of this great cookbook and what makes it even more special is to be published with friends! Congratulations and a huge group hug for all of us! You so deserve this, my friend! Happy dance, indeed! Congratulations! Way to go! Your blog is great and this is well deserved! I would say that's a gigantic WOO-HOO! Congrats to you! You deserve the props! Congrats! I can't wait to see the cookbook! Some of my favorite foodie friends are in it! Huge congrats - totally deserved!! I'm hosting GROW YOUR OWN #45 this month!